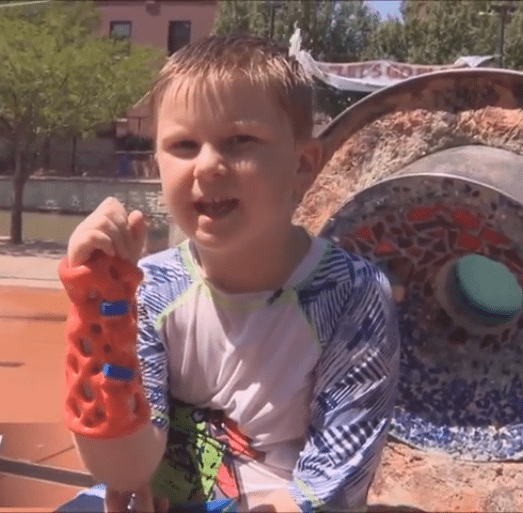 ABC News in Denver, Channel 7, The NOW program, interviews one of ActivArmor’s younger patients, Duncan, about how his revolutionary waterproof, 3D printed cast, allowed him to do all the things he love, in the SUMMER! The scene opens in the park, with Duncan playing in the fountain. He is wearing his ActivArmor, custom, 3D printed cast, while jumping around in the water. Because ActivAmor is completely waterproof and breathable, he can enjoy all the normal summer activities, that he would completely miss out on, if he was wearing a traditional cast or splint. The interview explores the story of how Diana got started, describing her work running a mentoring program for underprivileged children — some of whom were wearing traditional, plaster casts. She recognized the deficiencies of this very old technology, and was inspired to develop something different — and so much better! Thanks to this new waterproof, breathable, 3D printed cast, kids like Duncan can enjoy their summers, and the rest of the year — in spite of broken arms.